In my opinion, to be a writer is not only one of the toughest tasks in the world, it is also the most courageous, for to be an author is to take on the challenge, not only of pouring yourself into a novel, but in reaching an audience and making them feel the heart and passion you put into a story as well. In all honesty, very few authors truly succeed in this - writing is hard, who said it wasn’t? Thus, I can count on one hand the number of authors who have really gone above and beyond, who have truly pulled me into their worlds, and made me weep, laugh, sob, and smile - all in the span of a few hours. Jay Kristoff, ladies and gentleman, is one of them. Yes, this debut author happens to be one of those few authors whose novel has truly impacted me, perhaps not in my life overall, but definitely in the few hours I spent reading it. While Stormdancer is, by no means, a perfect novel, it is a novel with creativity, originality, and most importantly, with heart. If that isn’t enough to constitute it as a masterpiece, then I don’t know what is. I think the first thing that strikes you about Stormdancer, aside from its gorgeous cover, is the amount of research Kristoff obviously put into his novel. The futuristic Japan of Stormdancer contains many of the same cultural aspects of society, politics, and government that present-day Japan possesses which makes for an extremely authentic read. In Kristoff’s world, the land has been destroyed by the planting of lotuses, the skies are red with pollution, and Yoritomo, the power-hungry leader of this dying land, seeks a legendary thunder tiger. Griffins, what we would call a thunder tiger, are believed to be extinct, thus, Yoritomo’s request to Masaru, the best tracker in the kingdom, and his daughter, Yukiko, is believed to be impossible to fulfill and bring about certain death. Yet, against all odds, Masaru and Yukiko do find a thunder tiger and it is at that moment when Yukiko’s life slowly begins to change. When the lies she believed were truths are exposed and the enemies she believed were friends are revealed, Yukiko finally comes to accept her true destiny and challenge the might of her corrupt empire itself. I’ll admit it - Stormdancer and I got off to a rocky start. While I soaked up the rich world-building in the first few chapters of the novel, I also found it to be rather cumbersome to read as it was bogged down by detailed descriptions of practically everything. Since I am an avid Dickens’ lover and tend to appreciate long-winded and descriptive writing, I was able to trudge through the first couple of pages until the real action began; yet, I think for a lot of readers, the beginning of this novel will be a real challenge. Nevertheless, the world-building is one to truly admire in this story. Kristoff has covered practically every aspect of his world, from social and cultural norms, to political and governmental conspiracies, and from the city mindset to that in the rural areas as well. It is a richly imagined and vividly real world that the reader is thrown into and I loved every minute I spent in it. While Stormdancer is most certainly notable for its world-building and even its scintillating plot filled with politics and rebellion, it is the characters that really make it shine. Yukiko, our strong-willed heroine, is a unique and refreshing character to come across. I loved her maturity, her courage, her bravery, her strength to fight for what was right, and most importantly, her bond with Buruu, the thunder tiger. Theirs is truly a remarkable friendship and I found myself to be charmed by its slow development and moved by the heart and soul it contained. While Yukiko and Buruu are remarkable characters on their own, together they form an unbeatable team and often times, it seems as if they are one person. Yet, while their thoughts flow together seamlessly, it is easy to tell them apart by their distinct traits which I believe is a true testimony to Kristoff’s writing abilities. While Yukiko and Buruu most definitely have the most interesting relationship in this novel, the most heart-warming one is that between Yukiko and her father, Masaru. I loved the manner in which this relationship evolved – it was complex, confusing, heart-breaking, yet truly impactful. I could feel all the conflicted emotions Yukiko felt towards her father in my own gut and felt such a strong pull towards the relationship between these two, perhaps because we all have fathers ourselves. Even Yukiko’s changing relationships with Masaru’s tracking friends, one of whom happens to be the woman he slept with while Yukiko’s mother was still alive, were very realistically written and developed. I also felt a strong bond towards Yukiko’s dead twin brother and I admired how wonderfully Yukiko herself had been shaped surrounding this grief. While she is initially a tough character to like, her relationships with others and her rocky past makes her a flawed character, but an understandable, relatable, lovable, and admirable one as well. I fear this review is going to be a long-winded, but there is simply so much to love about this tale. I love the manner in which the political schemes played out in this story and especially Kristoff’s portrayal of women. Kristoff shows us that women, for all their beauty and charm, can be just as deadly and cunning behind the doors and decked in pretty dresses. I think he truly captured the female mentality and portrayed it in an extremely positive and strong-willed light. Even in his romance, Yukiko always seems to have the upper hand and remains to be unattached to her lover – for the most part at least. I suppose my only complaint with this was that I never really felt anything for the small romance in this novel, but then again, I don’t think we were meant to. Yukiko doesn’t need a man to define her and similarly, this novel doesn’t need a romance to define it. It is so much more than a love story, a friendship story, or even a political one. It is a blend of all these ideas and even more than that. I’ve said it before and I’ll say it again, Stormdancer has heart. It makes you feel for the relationships and friendships that are inside. It makes you hate the villains who are clever, cunning, and cruel – deadly combinations for sure. It makes you feel the fire of revenge, the cooling rain of friendship, and the wondrous feeling of loyalty. In fact, reading Stormdancer is so much like being Yukiko and living in her world that it is hard to catch your bearings when it is over. 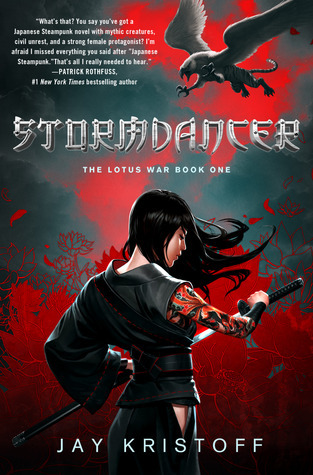 While it does have its flaws and I am sure many readers will find more faults with it than I have, I love Stormdancer for its originality, creativity, and for its ability to immerse me in a world with characters I can connect with. Furthermore, Stormdancer contains many subtle themes that blossom as the novel continues and while its ending isn’t a cliffhanger, it leaves you yearning for more. In every sense of the word, Stormdancer is a true literary wonder and an amazing novel masterpiece. Thank you to NetGalley and St. Martin's Press for providing me with a copy of this book in exchange for an honest review. I felt the same way about the beginning. But once the action started, Iw as TOTALLY HOOKED! EEEEEEEE. YES. EVERYTHING YOU SAID. YES, YES, YES! I am so ridiculously happy you loved this (and blessed us with an amazing review). The worldbuilding was absolutely magnificent and like you said, the amount of research Jay put in is... wow. Remarkable. But definitely, the relationship between Yukiko and Buruu was the absolute highlight for me in this. It was so beautifully developed, layered, DEEP and such a joy to read. I also agree with your thoughts on Yukiko's relationship with her father, I felt that was explored amazingly well. I'm so incredibly excited to see you gave this book 5 stars! It honestly sounds fantastic in every aspect. The rich world-building, the detail, the characters... I can't wait to experience it all! Thanks for mentioning the beginning too. I'll be sure to keep going if it doesn't at first grab me. :) I have an ARC from NetGalley so I plan to get stuck in soon. Thanks for the brilliant review! Stormdancer and I got off to a rocky start too, it was just so ROUGH and chock full of Japanese phrases that it was grating for me to get through. However, once I warmed it to it, it became pretty enjoyable. I really loved how moved you were by this novel! A beautiful review, Keertana! I totally laughed out loud at your 'detailed descriptions of practically everything' line. I giess for me it depends on how it's done.Back in Uni, I used to live and breathe Honore de Balzac and boy, he is descriptive. But sometimes, if it's just info overload with no real purpose, I get annoyed. All the reviews have been amazing, I'm starting this next and I just know I'll like it. Great review :-) I've been thinking about this one, but hadn't added it to my TBR, but it sounds right up my street. So glad you loved it! I so SO agree with you, though I'm only a short way through it at the moment. "I think the first thing that strikes you about Stormdancer, aside from its gorgeous cover, is the amount of research Kristoff obviously put into his novel." "I’ll admit it - Stormdancer and I got off to a rocky start. While I soaked up the rich world-building in the first few chapters of the novel, I also found it to be rather cumbersome." I do love it, but YES. I started a couple of weeks agoe, and haven't been able to truly get back to it, because I want to read when I have TIME. I want to give it my full attention, not a page here and there. Wow! I really need to get this book. After reading your review, I don't think I can decide to not do it. Wonderful review, Keertana! I'm about to start this as I just received a copy so thanks for the warning about the slow start, I do find that sort of thing off putting but I will keep reading knowing that the rest of the book lives up to the hype! Keertana, I love love love this review (though yes, I am just now digging through the backlog of your past few weeks). This is beautifully written, and I can feel the heart that went into it--I know just how you feel about this book because I've had such similar thoughts of my own toward others. I love when you can recognize that maybe a book isn't perfect, but that it worked so perfectly for you that you hardly care. I have heard repeatedly that the beginning is a bit to get through, and I'm interested to see how I'll encounter it. I, too, am a Dickons fan, so I'm hoping I'll fare well and sink into the world building. Also I love when a male author can write a female perspective well (think Phillip Pullman's Lyra), and I, for one, love a book that doesn't need to be propped up by romance! Thanks Heidi! (: I'm extremely curious to see what you'll think of this. If you like Dickens, you may not be as bothered by the initial prose as others were, so I think you'll like this after all. Plus, Yukiko's perspective was wonderful and the whole concept was so enthralling and unique!